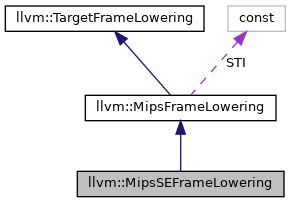 Definition at line 21 of file MipsSEFrameLowering.h. Definition at line 398 of file MipsSEFrameLowering.cpp. Definition at line 861 of file MipsSEFrameLowering.cpp. References llvm::RegScavenger::addScavengingFrameIndex(), llvm::MipsFunctionInfo::callsEhReturn(), llvm::MipsFunctionInfo::createEhDataRegsFI(), llvm::MipsFunctionInfo::createISRRegFI(), llvm::MachineFrameInfo::CreateStackObject(), llvm::TargetFrameLowering::determineCalleeSaves(), llvm::MipsFrameLowering::estimateStackSize(), expand(), llvm::MipsSubtarget::getABI(), llvm::MachineFunction::getFrameInfo(), llvm::MachineFunction::getInfo(), llvm::TargetSubtargetInfo::getRegisterInfo(), llvm::TargetRegisterInfo::getSpillAlignment(), llvm::TargetRegisterInfo::getSpillSize(), llvm::MachineFunction::getSubtarget(), llvm::MipsFrameLowering::hasBP(), llvm::MipsFrameLowering::hasFP(), llvm::MipsSubtarget::hasMSA(), llvm::MachineFrameInfo::hasVarSizedObjects(), llvm::MipsSubtarget::isGP64bit(), llvm::isIntN(), llvm::MipsFunctionInfo::isISR(), setAliasRegs(), llvm::MipsFrameLowering::STI, and TRI. Definition at line 688 of file MipsSEFrameLowering.cpp. References llvm::MachineInstrBuilder::addImm(), llvm::MachineInstrBuilder::addReg(), llvm::MipsABIInfo::ArePtrs64bit(), llvm::BuildMI(), llvm::MipsFunctionInfo::callsEhReturn(), llvm::MachineBasicBlock::end(), llvm::DebugLoc::get(), llvm::MipsSubtarget::getABI(), llvm::MachineFrameInfo::getCalleeSavedInfo(), llvm::MipsABIInfo::GetEhDataReg(), llvm::MipsFunctionInfo::getEhDataRegFI(), llvm::MachineBasicBlock::getFirstTerminator(), llvm::MachineFunction::getFrameInfo(), llvm::MipsABIInfo::GetFramePtr(), llvm::MachineFunction::getFunction(), llvm::MipsABIInfo::GetGPRMoveOp(), llvm::MachineFunction::getInfo(), llvm::MipsSubtarget::getInstrInfo(), llvm::MipsFunctionInfo::getISRRegFI(), llvm::MachineBasicBlock::getLastNonDebugInstr(), llvm::MipsABIInfo::GetNullPtr(), llvm::MipsSubtarget::getRegisterInfo(), llvm::MipsABIInfo::GetStackPtr(), llvm::MachineFrameInfo::getStackSize(), llvm::Function::hasFnAttribute(), llvm::MipsFrameLowering::hasFP(), llvm::MipsInstrInfo::loadRegFromStackSlot(), llvm::MipsFrameLowering::STI, and TII. 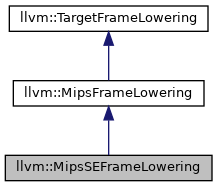 Definition at line 401 of file MipsSEFrameLowering.cpp. References llvm::MachineFunction::addFrameInst(), llvm::MachineInstrBuilder::addImm(), llvm::MachineBasicBlock::addLiveIn(), llvm::MachineInstrBuilder::addReg(), llvm::MachineFrameInfo::adjustsStack(), llvm::ISD::AND, llvm::MipsABIInfo::ArePtrs64bit(), assert(), llvm::MachineBasicBlock::begin(), llvm::BuildMI(), llvm::MipsFunctionInfo::callsEhReturn(), llvm::StringSwitch< T, R >::Case(), contains(), llvm::MCCFIInstruction::createDefCfaOffset(), llvm::MCCFIInstruction::createDefCfaRegister(), llvm::MCCFIInstruction::createOffset(), llvm::MachineRegisterInfo::createVirtualRegister(), llvm::StringSwitch< T, R >::Default(), E, llvm::MachineBasicBlock::end(), llvm::AArch64ISD::EXT, llvm::MachineInstr::FrameSetup, llvm::DebugLoc::get(), llvm::MipsSubtarget::getABI(), llvm::MachineFrameInfo::getCalleeSavedInfo(), llvm::MachineModuleInfo::getContext(), llvm::MCRegisterInfo::getDwarfRegNum(), llvm::MipsABIInfo::GetEhDataReg(), llvm::MipsFunctionInfo::getEhDataRegFI(), llvm::Function::getFnAttribute(), llvm::MachineFunction::getFrameInfo(), llvm::MipsABIInfo::GetFramePtr(), llvm::MachineFunction::getFunction(), llvm::MipsABIInfo::GetGPRMoveOp(), llvm::MachineFunction::getInfo(), llvm::MipsSubtarget::getInstrInfo(), llvm::MipsFunctionInfo::getISRRegFI(), llvm::MachineFrameInfo::getMaxAlignment(), llvm::MachineFunction::getMMI(), llvm::MipsABIInfo::GetNullPtr(), llvm::MachineFrameInfo::getObjectOffset(), llvm::MipsABIInfo::GetPtrAddiuOp(), llvm::MachineFunction::getRegInfo(), llvm::MCContext::getRegisterInfo(), llvm::MipsSubtarget::getRegisterInfo(), llvm::MipsSubtarget::getRelocationModel(), llvm::MipsABIInfo::GetStackPtr(), llvm::MachineFrameInfo::getStackSize(), llvm::Attribute::getValueAsString(), llvm::MipsFrameLowering::hasBP(), llvm::Function::hasFnAttribute(), llvm::MipsFrameLowering::hasFP(), llvm::MipsSubtarget::hasMips32r2(), llvm::MipsSubtarget::hasMips64(), I, llvm::MipsSubtarget::isABI_N64(), llvm::MipsSubtarget::isABI_O32(), llvm::isInt< 16 >(), llvm::MipsSubtarget::isLittle(), llvm::MachineBasicBlock::isLiveIn(), llvm::MipsABIInfo::IsN64(), MRI, Reg, llvm::report_fatal_error(), llvm::MachineInstrBuilder::setMIFlag(), llvm::Reloc::Static, llvm::MipsFrameLowering::STI, llvm::MipsInstrInfo::storeRegToStack(), std::swap(), TII, and llvm::MipsSubtarget::useSoftFloat(). Definition at line 777 of file MipsSEFrameLowering.cpp. References llvm::MipsSubtarget::getABI(), llvm::MipsABIInfo::GetBasePtr(), llvm::MachineFunction::getFrameInfo(), llvm::MipsABIInfo::GetFramePtr(), llvm::MachineFrameInfo::getObjectOffset(), llvm::MachineFrameInfo::getOffsetAdjustment(), llvm::TargetFrameLowering::getOffsetOfLocalArea(), llvm::MipsABIInfo::GetStackPtr(), llvm::MachineFrameInfo::getStackSize(), llvm::MipsFrameLowering::hasBP(), llvm::MipsFrameLowering::hasFP(), llvm::MachineFrameInfo::isFixedObjectIndex(), spillCalleeSavedRegisters(), and llvm::MipsFrameLowering::STI. Definition at line 843 of file MipsSEFrameLowering.cpp. References llvm::MachineFunction::getFrameInfo(), llvm::MachineFrameInfo::getMaxCallFrameSize(), llvm::TargetFrameLowering::getStackAlignment(), llvm::MachineFrameInfo::hasVarSizedObjects(), and llvm::isInt< 16 >(). Definition at line 793 of file MipsSEFrameLowering.cpp. References llvm::MachineBasicBlock::addLiveIn(), llvm::MipsABIInfo::ArePtrs64bit(), llvm::BuildMI(), llvm::MachineInstr::FrameSetup, llvm::MCInstrInfo::get(), llvm::MipsSubtarget::getABI(), llvm::MachineFunction::getFrameInfo(), llvm::MachineFunction::getFunction(), llvm::MipsSubtarget::getInstrInfo(), llvm::TargetRegisterInfo::getMinimalPhysRegClass(), llvm::MachineBasicBlock::getParent(), llvm::Function::hasFnAttribute(), llvm::MachineFrameInfo::isReturnAddressTaken(), llvm::MipsISD::MFHI, llvm::MipsISD::MFLO, RA, Reg, llvm::MipsFrameLowering::STI, llvm::TargetInstrInfo::storeRegToStackSlot(), and TII.